We are delighted to let you know that we have been awarded monies from the Aviva Community Fund to support our community growing initiative this year. We couldn’t have done it without all of you who voted for us, so huge thanks for the amazing 763 votes we received and thanks to Aviva for selecting us as one of their recipients. 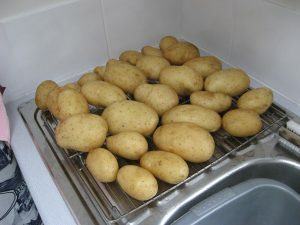 We look forward to sharing lots of free seeds, plants and of course seed potatoes with you all over the coming months. We are delighted and would like to thank Buchan Development Partnership for being a supporter of OSF again this year. We will be attending Seedy Sunday at Aden Country Park, Mintlaw on Sunday March 17th and giving away free seed potatoes and free seeds to everyone attending. We look forward to seeing you there! We have been featured in the first newsletter from the University of Aberdeen School of Education. This also notes the exciting development of a preview of our educational materials given by Laura Colucci-Gray to teachers in China. With the new year comes some new exciting developments for our programme. First of all, we have changed its name to OSF Garden Schools. This is to reflect our concept of Cultivating Education, with the aim that every school should be a Garden School, a place where outdoor learning is an integral part of the curriculum even where there is a limited amount of space available on school grounds. We are also now registered with the RHS Campaign for School Gardening, so look out for links to some of their resources that you can use when planning school lessons. We will also be keeping you up to date with ideas for getting pupils involved in growing their own crops, and letting you know about our big free seed giveaway! Just like our OSF Garden Schools Facebook page and let your fellow educators know about us. We are here to help and answer your questions too, just get in touch. Here’s to 2019! Nice to be included in this quarter’s Green Times with photos from the EcoCity Awards. Also some information about Climate Week North East 2019 which we are taking part in with stalls and talks – details to follow in the new year. We are delighted to have been told today that we are a finalist in the Health and Wellbeing category for the Aviva Community Fund this year. We couldn’t have done this without the hundreds of votes we received, so thanks to all of you who voted and shared our posts with others encouraging them to vote. We won’t hear if we are winners for a couple of months, but thanks for all of your support to get us this far. We are delighted and humbled to have been awarded the Sustainable Food EcoCity Award in Aberdeen for our OSF School Gardens and Seed Potato projects. We are taking part in the Aviva Community Fund and are asking you to register and vote for our project. It is only by being successful in funding applications such as these that we can keep our project going, and your support would be very much appreciated so we can keep on giving away free seeds next year. If you could share this message too that would be great! Thanks to everyone who we spoke to at the George Street market today. 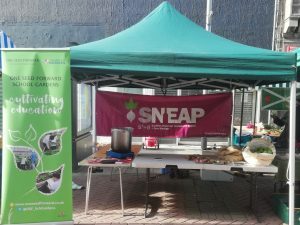 Pleasure to share a stall with Craig from Sneap and TAMS and to be able to give some excess potatoes and apples to CFINE for the foodbank.